Dr Sasi Victoire is a multi media artist and author based in Cairns, Queensland, Australia. Sasi uses a variety of art processes with a focus on community and cultutral collaborations that are issues based to achieve quality exhibitions. She wrote, illustrated and self published 2 children's books in 2009 for Queensland's 150th birthday celebrations. 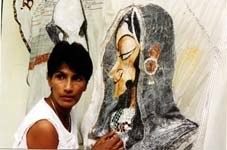 Sasi is also an art educator and speaker. Sasi has curated several international artshows.